With fixed barrel/under lever cocking system and break open loading port. The Dominator features a Quattro Trigger & SAS™ shock absorber system for a great shooting experience. 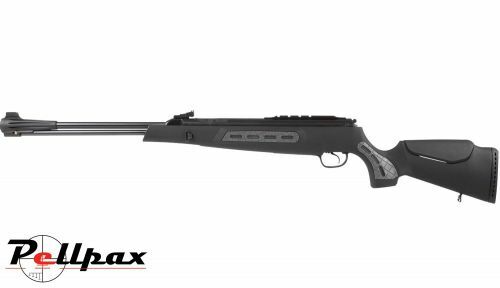 The precision-rifled steel barrel gives very good accuracy and consistency and the manual & automatic cocking safety ensure that the rifle is discharged when you want it to. The stock is constructed out of a synthetic advanced polymer, and the rifle also features a scope mount rail & shock absorber scope stop and gold-plated trigger blade. With micro adjustable rear sight for both windage and elevation with Truglo fiber optics, you are sure to hit your target, and as an added bonus, a bipod and sling are included.